While in college,the only time I properly ate food was during breakfast.Lunch was a quick bite and a cold drink,tea was gulped down hurriedly and dinner was had in front of tv or while on the phone.I guess those five years in College were the only times I troubled amma being a teen[almost out of teens,teen:)].Soon after I got married and even though I whipped up few stuff in my kitchen,I struggled with what-to-make-for-breakfast thoughts.Both amma and ma-in-law made varieties of food for breakfast day after day and all I could think of was making dosas or idlies of readymade batter:). I’ve come a far route from those days and can think of many ideas even if I don’t have any leftover batter[home-made;)]. I first had Poori and Aamras at one of hubby’s cousins wedding.I was blown away with the yummy combination,something I’ve never had before.After a while,we cousins stopped having poori and had only bowlfuls of aamras.We almost felt dizzy afterwards,eating so much of it:). Summers are the best times to try out such royal dishes for breakfast since mangoes are available in abundance.We couldn’t stop eating this yummilicious breakfast:). Mix salt with atta,add water and make a firm dough. Knead the dough for a few minutes till the surface becomes smooth. Poori dough should be firmer than chapathi dough or else it will soak up too much oil. Pinch off small balls of the dough,flatten with a rolling pin and deep fry them in hot oil,till they puff up and become golden brown. Check out Indira’s and Shilpa’s Poori pictorial for more info. Make a smooth puree of mango pulp,sugar and milk. Add saffron,crushed cardamom and mix well. The texture of the aamras should be such that it should fall in dollops when served. Chill and serve with piping hot Pooris. To Srivalli for her Mango Mela. ive had poori with shrikand but never with aamras..mmm..i can only imagine how delicious this will taste!! i simply love this combo..out of the few mangoes I could get this year in singapore, I did make poori aamras one day,..did not have the patience to take pictures and all..
Oh my aamras looks heavenly dear! and very nicely presented! 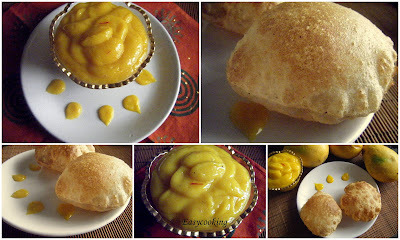 poori and aamras is a must have during the season of mangoes. looks really delicious. Love the combo.. yea I love Aamras pooris, srikhand pooris and also sheera-poori.. classic Mumbai konkani food. What an awesome combo Divya! Never had this before! Divya, such awesome and delicious pics! i have heard that this is how pooris are served in bombay but first time i am seeing this! interesting.. This makes a great breakfast! Thanks for sending this to "Show Me Your Breakfast " event!! Looks delish DK. I love how much can be done with mangoes. Your aamras looks lovely! hot pooris and aamras ..great combination! Puri with aamras and puri with shrikhand are two of my favorite combinations, looks perfect and delicious !